Union Square facing north, with Temple E-mmanu-el a block away on Sutter, c. 1875. Today San Francisco's Union Square forms one of the most notable outdoor spaces in the world, functioning as a major "urban room" in the heart of downtown San Francisco. The history of the Square goes back to the city's very beginnings. Early maps of San Francisco based on surveys by Jean Vioget (1839) and Jasper O'Farrell (1847) show Washington Square and Union Square, both then unnamed, reserved as public squares. Union Square officially first became public property when Colonel John Geary deeded the land to the city in 1850 with the stipulation it be held in perpetuity for park purposes. Colonel Geary had served in the Mexican War. He became the first mayor of San Francisco under American rule, and later served as governor of both Kansas and Pennsylvania. During the Gold Rush, a massive influx of prospectors swelled San Francisco's population. All open spaces in the city were used as campgrounds, including the environs of Union Square then an area of wind-swept sand dunes dotted with chaparral. In the 1850s, the present day square contained a large sand hill, and the land sloping from its base toward Market Street was known as St. Anne's Valley. Eventually the sand hill was leveled by steam paddies, and the excess dirt was used as landfill. Soon all four sides of the Square were in great demand for home sites, and within the next few decades, Union Square became the center of a fashionable residential district with churches plentifully interspersed. But this lack of development was remedied with the passage of the Van Ness Ordinance in 1855. Although the ordinance was primarily directed at the squatter problem, it also designated land for public park purposes. More importantly, the ordinance gave the responsibility for squares, parks, and grounds of public buildings within the city to the Park Commission, which was charged with remodeling these sites. One of the first to receive attention was Union Square, although documentation as to the actual physical changes made around 1860 is lacking.3 Most likely, the steam paddies did not level the site until after passage of the Van Ness Ordinance. In 1854, the Mechanics' Institute was founded in San Francisco, with the purpose of advancing the mechanical arts and sciences. Eventually, it became traditional for the Institute to hold yearly mechanics and manufacturing fairs. In 1864, the Institute requested permission to build a pavilion in Union Square, and since the city needed a large indoor gathering space, permission was granted. In 1864 and 1865, fairs were held in this pavilion, a rambling wooden structure on the eastern side of Union Square at the corner of Geary and Stockton streets. In 1868 a new Mechanics' Pavilion was built in Union Square. Supposedly, 8,000 people could be seated in the pavilion. It also held a skating rink and an art gallery and may have contained classrooms for apprentices in the mechanical and industrial arts.5 Here, industrial fairs were held until 1871. Afterwards, the pavilion was torn down and a new site was acquired elsewhere.6 When not in use for industrial fairs, the pavilions served as social gathering halls for the elite. Dances and costume balls, music events, and public lectures were held. 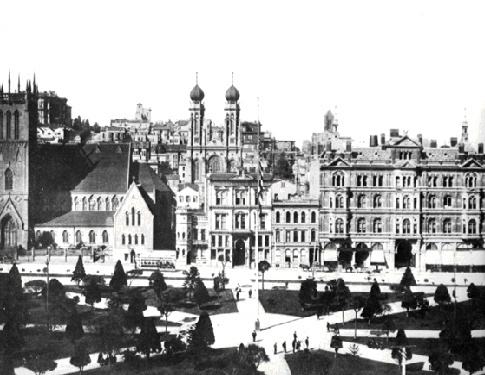 Sometime after the removal of the Mechanics' Pavilion in 1871, but before 1880 (the date of the first photo-documentation of the Square), Union Square was first formally designed as a park. Photographs show dirt or gravel paths running diagonally from street corner to street corner and other paths at cardinal points, in the manner of the Union Jack on the British flag. All pathways intersected at a small, circular paved area in the park's center where a flagpole stood. Along the Square's periphery ran a picket fence with openings to the sidewalk and street. Inside this fence was a small strip of planted beds and secondary pathway system along the park's periphery. Several benches were placed along the peripheral pathway in front of a strip of land planted with a variety of trees, but benches were absent from the center areas of the Square. The design was virtually identical to that of Portsmouth Square at the time, including the idea of placing a flagpole at the center of the Square. In the swathes of land left between the park's intersecting pathways were informal plantings of grass and several exotic species of plants. Among these were Dracaena palms (Cordyline australis), New Zealand flax (Phormium tenax), Norfolk Island pine trees (Araucaria heteropylla), century plants (Agave americana), pine trees, and others. Diagonal walks were lined with rows of false cypress (Chamaecypari. laeusoniana).7 This collection of exotic, nonnative plants was characteristic of landscaping in Victorian times. The use of grass in public squares was new in California, with its Spanish and Mexican heritage of gardening. The Americans had brought with them the tradition of English landscaping large lawn areas with scattered trees. The contrast between the formal pathway system and the informal plantings was unusual, but remained characteristic of each succeeding design of Union Square, despite the sloping topography. Before 1900, land use immediately around the Square was mixed, with churches, residences, and shops. By 1870, churches were the most notable structures. At the corner of Powell and Geary streets was Calvary Presbyterian Church, built in the classical style, where the St. Francis Hotel now stands. The church replaced a small house and stable on the site. At the corner of Post and Powell streets stood Trinity Episcopal Church, in the Gothic Revival style. And at the corner of Stockton and Geary streets was the First Unitarian Church, also in the Gothic Revival style, which was dedicated in 1864.8 In addition, the Union Square Baptist and the First Congregational churches were close to Powell and Post Streets. Paradoxically, on adjacent Maiden Lane, then known as Morton Street, the City's first red light district flourished.9 At Stockton and Geary streets was the old City College, and in 1884, the Wigwam, a large structure of galvanized sheet iron that served as the Republican Party's presidential campaign headquarters that year. Later the Wigwam was leased out and run as a vaudeville theater.10 The Cosmos Club and the Pacific Club, the Academy of Sciences, and the Armory all at one time were located at Union Square. The appearance of the streets surrounding the Square, as well as most of the city, changed considerably every 10 to 15 years -- so much so that each generation grew up in an entirely different city. 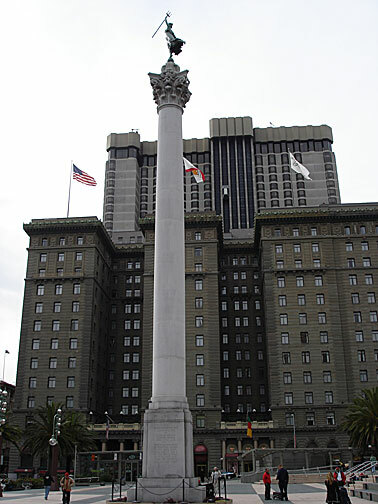 At the turn of the century the Square underwent a major design change, largely due to San Francisco's role in the Spanish American War of 1898. At this time the city became a major naval port and the embarkation center for troops sent to the Philippines. After the war, there was a movement to erect a monument commemorating the destruction of the Spanish Fleet in Manila Bay by Commodore Dewey's squadron on May 1, 1898. Mayor Phelan organized a citizens committee which selected Union Square as the site for the monument, probably because of its name and central location. The park was redesigned in preparation for the monument, which was dedicated by President Theodore Roosevelt on May 14, 1903. President Roosevelt rides in horse-drawn carriage on Van Ness, 1903. Union Square Monument dedicated to Admiral Dewey at Manila, St. Francis Hotel behind. President Theodore Roosevelt dedicates the Dewey Monument in Union Square, May 14, 1903. In the actual redesign of the Square, the Monument replaced the old flagpole at the center of the park. The new design eliminated the pathways going in the cardinal directions and the old perimeter walkway. The four diagonal pathways now branched around elliptical beds of shrubbery converging at the central ellipse containing the Dewey Monument. Photographs taken about 1905 reveal the central ellipse and pathways, up to the four secondary ellipses, to be lined continuously with benches, a marked change from the former design. It was at this time that the Canary Island palms (Phoenix canariensis), now so characteristic of Union Square, first appeared. A row of palms was planted continuously along Post Street, and other perimeter areas were planted with miscellaneous shrubs and small trees. Shrubbery was also planted at the corners of intersecting paths and inside elliptical beds, leaving wide, uninterrupted stretches of grass between pathways and giving the park a much neater appearance. Exotic plants were replaced with more uniform plant material. As for the surrounding area, by the turn of the century, a major retail shopping area had come to be centered around Union Square and along Market Street from Third to Eighth streets. This retail district consisted of a number of hotels, stores, restaurants, and motion picture houses, most of which were to be devastated in the earthquake and fire of 1906. One of the major additions to the Square was the construction of the first two wings of the St. Francis Hotel in 1903. By March 2, 1904 the hotel had opened. It was, and remains, the tallest structure (13 stories) facing the Square, forming an impressive backdrop for the Dewey Monument. Disaster struck Union Square and San Francisco with the earthquake and fire of 1906. Structures surrounding the Square were completely destroyed and the St. Francis, though it survived, was gutted.